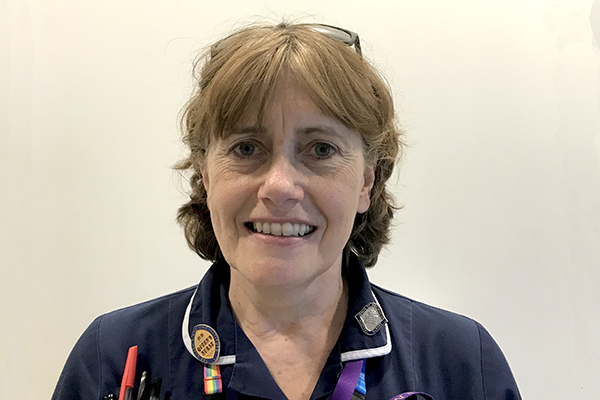 A regular on Radio 4, district nurse team lead and specialist community practice teacher at North East London NHS Foundation Trust, Liz Alderton discusses why not listening to criticism was the best thing for her career. I am a district nurse based in Harold Hill, a large housing estate in North East London. I manage a team of 22, comprising band six and five nurses and health care assistants, and I run a caseload totalling more than 500 patients across the team. We visit anyone over the age of 16, who is housebound and requiring nursing in the home. Typically, care includes health promotion, long-term conditions’ care, post-operative care, wound management, intra-venous therapy, palliative and end of life care. We are also have placements for student nurses, associate nurse trainees, specialist practitioner students, medical students and student paramedics. We are integrated with therapists and community matrons and are co-located with social services staff, working closely with GP staff, care staff, specialist nurses, hospices and the voluntary sector. I trained in 1980-1983 at Westminster Hospital, which has now been closed and incorporated into The Chelsea and Westminster. On my first ward placement, I had a bad report and the sister said she didn’t think I was cut out for nursing. Thank goodness I ignored her, as 37 years later I’m still nursing and enjoying it. I started working in the community in 1985, because I enjoyed my community placement as a student. You are a regular on BBC Radio 4, why is this important to you? What do you hope to achieve by doing this? I have appeared on radio because I am passionate about promoting district nursing and helping the wider public to understand the importance of the role. I feel this is essential in ensuring that NHS resources are directed towards primary care, where the vast amount of care takes place and I believe that the future of care in the NHS depends on a solid infra-structure of community based services. The day to day challenge of caring for people as a guest in their home: juggling poor resources, heavy caseloads, skill mix, an often less-than-ideal working environment, multiple co-morbidities and complexity of care. I suppose all the ways in which I can make a real difference in people’s lives, whether it is training someone to manage their own diabetes care, healing a chronic leg ulcer, promoting independence, treating acute illnesses, providing palliative support and symptom control or providing end of life care. Receiving the Queen Elizabeth the Queen Mother award for outstanding service in recognition of my commitment to the provision of excellent care. I see this as a recognition of the amazing work that community nurses give countrywide and I am just one representative of thousands like me who continually, and successfully, strive to provide excellent community nursing care. I enjoy running and cycling, singing in two choirs, playing the piano and reading. District nursing requires you to be fast thinking (and fast moving); a confident and expert autonomous practitioner with advanced clinical and communication skills, and a good team player. I would recommend they consider a career in community nursing if they are driven, use their initiative, the ability to think outside the box and to be an advocate, excellent clinical and communication skills and a real desire to improve people’s lives. The role is stimulating, challenging, tiring, infinitely varied and very satisfying and there are many chances to develop clinical skills and acquire knowledge across a broad range of specialities and umpteen opportunities to ‘go the extra mile’.